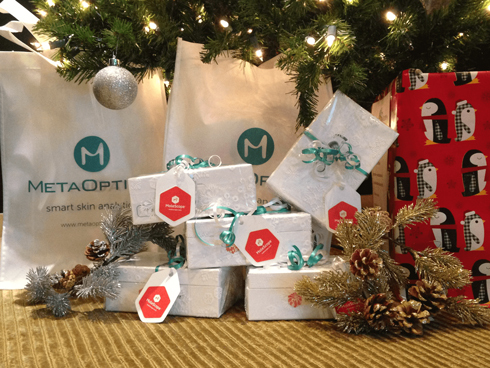 This Holiday Season, the MoleScope Team donated a MoleScope to 5 brave warriors and their families. With the help of Kristi Donahue, we were able to reach out to the pediatric melanoma community and give the gift of MoleScope to 5 contest winners within her network. Kristi Donahue is a role model and incredible advocate within the melanoma community. A melanoma survivor herself, Kristi was featured in local news outlets earlier in 2015 after finding a suspicious mole on one of her clients’ heads at the barbershop where she works. Following Kristi’s persistent encouragement, this client went to see a dermatologist and was diagnosed with melanoma. Fortunately, the melanoma was caught just in time; Kristi’s insistence had saved herclient’s life. This inspired Kristi to continue raising awareness and teaching her clients about the warning signs of melanoma. She has since turned her station at the barbershop into a melanoma booth, and has most recently transformed her SUV into a mobile billboard campaign by wrapping it in information on melanoma and creating awareness in her town. Her car, named Hope, also serves as a tribute to melanoma warriors and angels that Kristi has met throughout her crusade. Working with Kristi has been an incredible experience for the MoleScope team and we are honoured to have been a part of her campaign and to have connected with her ever-growing network of courageous melanoma educators and warriors. Hearing their stories and words of thanks was incredibly motivating for our team and we will definitely be holding more contests like this in the future. Kristi is an inspiration to us all - do not be shy to take action if you see a funny spot or mole. Prevention and early detection are both key to good health, and sometimes it takes a little encouragement and reminder from loved ones to remind us to love and protect the skin we are in. Be positive and take initiative by looking out for your own skin health, as well as the skin health of others around you this holiday season. As the year comes to a close, we wanted to thank you all for your continued support - this was a big year for us! Looking forward to an exciting 2016.